1)Alessandra, you look young, what’s your beauty secret? There is no secret…taking care of yourself, of your skin, and preserving your youth is an everyday job and it requires consistency. And even if you were generously gifted by nature it still doesn’t mean that you can neglect taking care of your skin. As for me, I take it seriously and the health of my skin is the payoff. And with the number of techniques, improved equipment, and products it’s getting easier every year. You just have to find the real professional who will guide you through …..
2) What made you want to open a medical spa? First of all, my passion for the aesthetics and beauty… Besides I had a chance to live in Asia (in Singapore) for some time, I also lived in several countries in Europe and all the time was observing how this industry works on different continents, how women (and men) take care of themselves, how they try to preserve their youth or enhance something in the appearance. So when I first moved to New York I noticed that this is an amazing busy city with a lot of opportunity and places of different kinds for its citizens. But almost everywhere you go for your beauty needs you either feel as if you are in the sterile doctor’s office or it’s a tiny (and very often not clean) place or you are rushed at your appointment and don’t have an opportunity to get what you were supposed to. This is where appeared the idea to create an oasis for all beauty needs…a so-called beauty boutique in the heart of New York where you can meet the best experts of the industry with a large amount of experience and a solid aesthetic and laser background, reputable and the latest equipment, most advanced techniques (which we carefully select from the worldwide best practices), a customized approach and at the same time amazing clean, bright, beautiful space with 27 windows overlooking 5th Avenue and 57th Street, relaxing atmosphere and friendly staff at every step of your experience. 3)Why medical and what’s your beauty mission? As I mentioned before, the aesthetic industry and beauty, in general, is my passion. Nowadays we have so many techniques and tools to stay beautiful and young without surgeries, downtime and major procedures and this industry is developing with rapidly. For example, just a few years ago you had to go to plastic surgeon to correct your nose shape when now you can do it with an easy injection skipping anesthesia and terrible downtime. Isn’t it amazing? And my beauty mission is, of course, to stay on top of the industry and to offer the best that one can find on the market pairing it with the quality of services that I consider to be really important…when we are talking about your appearance, your health or beauty you cannot sacrifice or neglect anything. Everything should be Perfect. That’s my mission. 4) Your spa is working with ZO and Obagi products, we have tested their products and fell in love with them, but why did you choose this brand? First of all, we tried many different brands, we were using all of them on ourselves as this is the best way to understand the products and its benefits before offering them to clients. As for ZO by Dr.Obagi, this is well-known and established brand. It has a huge history, many many years of research, strong scientific foundation, a lot of fans all over the world and thousands of exciting testimonials and the Doctor who created this brand…is an absolute professional in his sphere and is still in high demand traveling all over the world hosting workshops and educational sessions. For me, all this proves that we made the right choice. And besides, we don’t have a single client who was unhappy with the products and the results…and I’m happy to hear that you loved it too. 5) What’s your beauty routine? I live in the City with all the pollution and toxins, lack of time and a lot of stress so I pay serious attention to my beauty routine and the cleaning of my skin in particular. I do double cleaning every evening so to be sure that I removed all dirt before I apply any kind of product on it. I have a range of products at home (and all of them are medical grade) to take care of my skin. Moreover, 1 or 2 times a month I do professional facial and peel with professional products and using professional equipment (such as Dermal Infusion) giving an opportunity for the specialist to see my skin, to analyze it and adjust my home regimen or just give me some recommendations and tips. 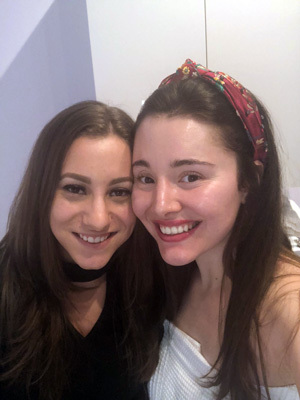 In addition, I do some seasonal treatments depending on the needs of my skin at this exact time, for example after summer I can do several sessions of IPL to get rid of pigmentation; in winter time I like to do laser treatments to rejuvenate my skin, from time to time I do micro-needling to deeper nourish, pumper my skin and boost collagen production that is so important to stay young. So I would say that the biggest secret is to listen to the needs of your skin, to be consistent with your care and regimen and trust your skin only to the hands of professionals. 7) Are you following a healthy lifestyle to look like a teenage girl or it’s genetic? Thank you so much. I try my best to follow healthy lifestyle…to eat clean, to have regular workouts, to sleep not less than 7 hours etc… However, living in the big city, having two kids and running a business requires a lot of time from me…but if you want to look good and flawless there is no excuse… you have to take it seriously and not when you are 50 but when you are 20. And be sure it will pay you off. 8) If a person visiting a spa for the first time what treatment would you recommend to start? First of all, I recommend to come for the consultation, to spend some time and discuss all issues or concerns with the beauty experts. Everyone is unique and there is no single remedy for everyone. But we can customize the regimen and beauty plan according to what you want to perfect, enhance or to preserve. 9) What is the most popular treatment these days? Well, it is going to be hard to distinguish one favorite treatment, everyone has their own. Facials are popular because our clients understand the importance of skin care and its consistency. But the most popular and always in demand are the body sculpting and weight loss treatments, anti-cellulite services and various skin rejuvenation techniques. 10) Brittany, please tell us how did your beauty journey begin? When I was a little girl I was always fascinated with any beauty regimen, whether it was makeup or skincare. Knowledge is power, so I enrolled at the Aesthetic Science Insitute 4 years ago and received my Esthetics License. I put my career on the fast track and worked in an array of holistic spa’s, medical offices, and at Mohonk Mountain House Resort & Spa. That was just the tip of the iceberg, I was determined to land my dream job and wouldn’t settle for less. I finally made that dream come true! I’m a Catskills native now commuting to NYC to work right here on 5th Avenue at Perfect 57 Medspa. This is my Mecca, all my skincare dreams come true here. I get to provide a magnitude of services with the ability to customize and cater to each individual client to reach their beauty goals. And I couldn’t be happier! 11) You did Perfect57 Signature Facial for our expert please, tell us more about this facial and what kind of procedures and products were used? The first thing we did was a skin analysis to determine what exactly is best for her skin type, while also concentrating on any specific concerns of hers. This facial then began with steam while cleansing and removing with warm cotton rounds. I’m a big believer in doing a double cleanse so I first used ZO Skin Health Normacleanse (for normal->dry skin, prepares the skin to receive therapeutic treatment while hydrating and nourishing) , and then iS Clinical Cleansing Complex (for all skin types, incorporates a balance of bio-nutrients and antioxidants that thoroughly cleanses the surface and pores). Next, I used an appropriate exfoliant (ZO Skin Health exfoliating polish which has ultra fine magnesium crystals to remove dead skin cells and increase epidermal turnover with key ingredients such as vitamins A, C, E and C-esters which help maintain skin barrier function). Next step would be extractions if necessary removing any blackheads or whiteheads using my gentle touch with gauze wrapped around my fingertips. Followed with a calming and relaxing lymphatic facial and décolleté massage using an essential Lavender oil. After that I chose the appropriate mask for her skin type, I used ZO Skin Health Sulfar Masque (deep pore cleansing while absorbing surface oils, dirt and debris that blocks pores with key ingredients such as glycerin to hydrate and restore skin barrier function). While the mask sets in I perform a upper body and neck massage mostly for relaxation and to relieve any stress and pressure within the muscles. Once completed I remove the mask using a warm towel. I then applied the appropriate eye and treatment serums (I chose ZO Skin Health Hydrafirm this minimizes the appearance and multiple signs of aging around the eyes- key ingredient retinol. Next was iS Clinical Pro-Heal Serum Advance reduces inflammation including key ingredient vitamin C which fights against free radical damage and finally I used iS Clinical Hydra-Cool Serum, provides intensive penetrating hydration, calms, cools and soothes skin while revitalizing aging and compromised skin). Next is applying a moisturizer and I chose ZO Skin Health Daily Power Defense. Followed with lip treatment application using ZO Skin Health Liprebuild (plumps and improves overall shape while stimulating collagen and restoring hydration including a peptide Complex and vitamins A and E) and of course last but not least SPF. I used iS Clinical Extreme Protect SPF 30 which is a UVA/UVB protection with powerful antioxidants to restore skins barrier. 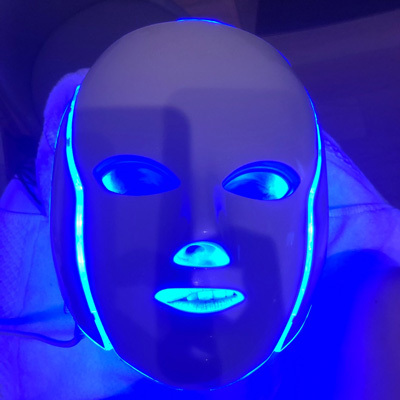 We also customized this facial by adding on dermaplanning and LED Light therapy which is an extended 35 min to the facial service. 12) Please tell us more about skin evaluation process? Using a Mag Lamp and light I am able to get a closer look at each clients skin. Everyone’s skin tells a story, from their diet and food choices, medications, hyperpigmentation, pore size, hormone related issues, acne, scarring, hydration within the skin, oil production and so on… observing, touching and feeling the skin as well as talking with the client to get a better understanding of their background and skincare history and what their concerns and goals are is essential to planning their facial in that moment and in the near future. 13) What are the products and devices you used and why? At Perfect 57 we’re using Pharmaceutical grade skin care lines. 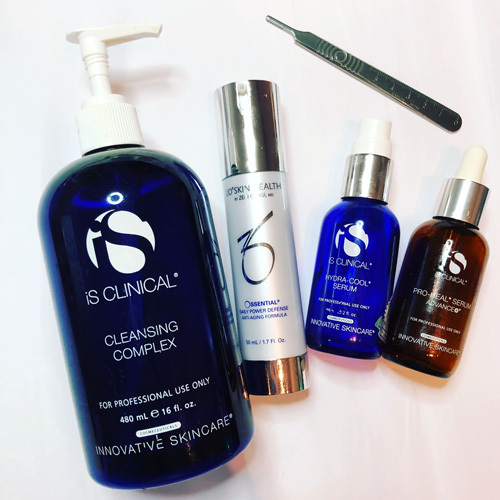 We use ZO Skin Health: products have been optimized to treat a range of skin disorders and chronic conditions and iS Clinical products provides visible skin appearance and health. These two product lines are the powerhouse that allows me to correct and perfect each clients skin. 14) What are the benefits of Led treatment? 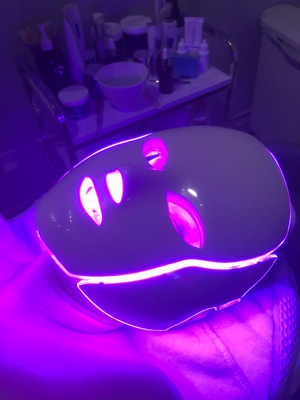 LED stimulates collagen production and healing, the light kills bacteria causing acne and treats blackheads, reduce pore size and tightening skin…and it only takes 20 minutes! 15) The dermaplaning procedure looks like shaving – is it safe? When preformed by a properly trained professional dermaplaning is very safe. I would suggest to avoid the trending DIY hacks shown on YouTube and other websites. Save yourself the risk and see a professional. Dermaplaning is a physical form of exfoliation similar in theory to microdermabrasion. Using a scalpel we remove a top layer of dead skin. 16) Our expert noticed, when you were cleaning her face you were using a super soft magical cotton handmade pads, what were they? Yes! She did! Everyone always stops me and asks to see what I’m using because aside from the fact that it feels so good, they can never figure out what exactly it is that they’re feeling! I guess it would be considered “old school” now with all the options we have out there. But I keep a roll of cotton in my facial room, cut 4×4 squares by hand, wet them and then mold them into circle shaped pads. Depending on the client coming in I’ll either place them in the hot towel cabby or I’ll let them go cold to help with inflammation of the skin. It’s the little details that really stand out and make clients feel special. And I’m happy that my cotton rounds are always noticed and appreciated. 17) Brittany, What are you using for your skin care routine at home? My mid 20’s have blessed me with oily/acne prone combination skin. I’ve been managing it for about 4 years now, with extensive research and trial and error I’ve learned with my skin “less is more” my home care regimen consists of entirely of THREE products! I’m using iS Clinical Cleansing Complex morning and night (double cleansing) strictly with cold water to reduce and prevent inflammation. Next I use a droplet or two of iS Clinical Pro Heal Serum Advance, it inhibits my skins natural ability to heal which is great if I have breakouts, while also evening out my skin tone. Last but not least I finish off with iS Clinical Hydra Cool Serum, it’s technically a serum but also can be used as a light-weight moisturizer, so that’s perfect for my skin. The Hydra Cool serum is calming and soothing, incredibly hydrating while balancing my oil production. I also use ZO Skin Health Smart Tone as my tinted moisturizer. It’s SPF of 50 broad spectrum, it’s really cool… it starts out white and as you work it into your skin it’s also adjusting to the proper skin tone. It evenly covers my face and leaves my complexion looking flawless. These products keep my skin in check. And I’ve noticed incredible results with minimal breakouts and evening out my skin texture. I also am very strict with taking care of my skin on a professional basis, I consistently use the LED mask 3 times a week to prevent future breakouts, and to help with my hyperpigmentation. I also make sure I get a facial once a month for an overall healthy maintenance. This allows me to achieve the optimal results from my homecare regimen….. have I mentioned how convenient it is to work in a medspa for my skin? 18) Brittany, what are your beauty hacks? Good question. I think anyone that knows me would say ICE! I practice what I preach. For inflammation, and cystic acne I wrap an ice cube up in a paper towel and roll it around for 15 mins. I attempt to stay away from traditional makeup and foundations, I like letting my skin breathe, besides with healthy skin you won’t need to hide it! Also, I try to eat clean, I try to minimize my sugar, dairy and wheat intake. I truly believe my eating habits affect my skin, and I try to drink as much water as possible every day. I’m not perfect when it comes to my eating habits but putting in the effort is half the battle. 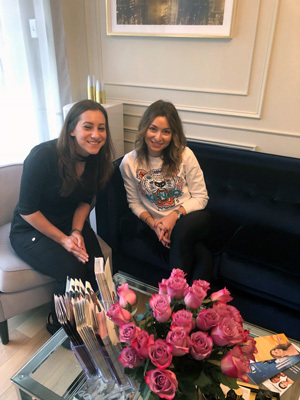 Thanks so much Perfect57 MedSpa – you are one of the best!